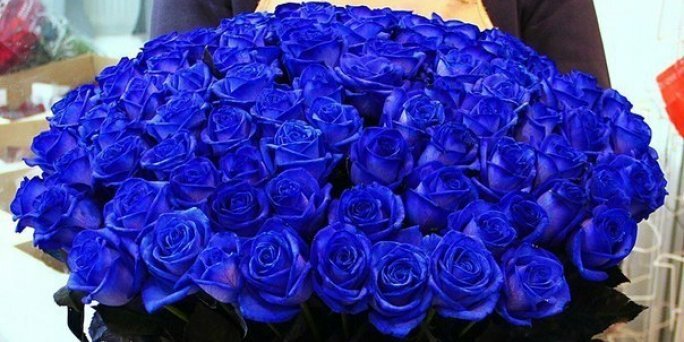 ❶ Order delivery of a bouquet of blue roses to Riga or another city of Latvia in KROKUS. Order delivery of a bouquet of blue roses to Riga or another city of Latvia in KROKUS. You can order a delightful bouquet of blue roses with delivery to any address in Riga and all over Latvia, using the convenient online service of the best online floristic shop of the capital KROKUS. You can surprise and please your relatives with a unique gift for a birthday, anniversary, wedding, graduation or any other solemn event by sending a bouquet of blue roses to Riga or any other city in Latvia. A chic and original composition will be enjoyed not only by real connoisseurs of floristry, but also by simple lovers of bright and unusual presents. You can buy a bouquet of blue roses in Riga (Latvia) for your girlfriend or woman, and for a guy. Men will appreciate the gift in the form of flowers of such a rare colour. Prompt flower delivery in riga at the best price is available for order on the website of the online shop KROKUS. wedding compositions for a bride, etc. In addition, the specialists of KROKUS studio offer all the desired to apply for a flower design of holidays or solemn events. The interior of hall, house, apartment, office, restaurant or cafe, decorated with bright blue flowers with a rich shade of buds, looks very impressive and creates an unusual atmosphere on the holiday. You can see examples of our florists' works by visiting the pages of KROKUS in social networks and looking at picture of a bouquet of blue roses that already found their customers from Riga (Latvia). To send rozes to riga online is possible in just a few clicks, having spent only a couple of minutes! How much does a bouquet of blue roses cost in Riga (Latvia)? The cost of a bouquet of blue roses depends on the size and number of flowers, as well as the complexity of the ordered composition. A vivid example can serve as a bouquet "Lazurite", presented in the catalog of our goods. The price of the composition in a compact size (25 flowers) is 102 euros. A more affordable variant may be premium roses of blue colour without of decor. A small bouquet of 15 such flowers will cost only 45 euros. To find out more information about bouquet prices, just call us at the indicated number. You can also make an order in the phone mode or on the official website of KROKUS.